For many watch brands, connecting the watch strap such that it does not come loose is a simple as using a simple buckle. But for Rolex, who uses 904L or 316L stainless steel Oyster or Jubilee links, the buckle is no simple affair. At face value, terms such as the Crown Clasp, Easy Link, GlideLock, FlipLock, Oyster, and OysterLock makes one not sure if they are talking watches or adult toys. Connecting a watch bracelet is an important affair because the clasp is something that wears with each opening and closing and thus must be durable and secure, yet is simple to use and is comfortable. Many watch manufacturers have wrestled with making a clasp that is durable, simple, reliable, and complements the bracelet. Crown Clasp: The CrownClasp is a concealed folding clasp patented by Rolex. The mechanical buckle is concealed under the Jubilee bracelet and only a simple Rolex crown shows. The CrownClasp and concealed mechanism give the Jubilee bracelet a never-ending, infinity-like appearance that is very elegant. GlideLock: The same term is used for two different clasps on the new Rolex Submariner and DeepSea. Both clasps are engineering marvels whereby there is an integrated adjustment of 1.8mm increments inside the clasp. Both Glidelock clasps allow for a full 18mm (almost 2cm) of fine adjustment without adding / removing links. The Submariner version has the fine increments on the underside of the clasp, and the DeepSea features a lift-up version allowing the wearer to make adjustments without removing the watch. Oyster Clasp: The Oyster clasp is designed to complement the Oyster bracelets. There are two version of the Oyster clasp. The older versions, more commonly known as tuna can clasps are made of folded and soldered stainless steel. Even though they feel real light, they are extremely durable and easy to make fine adjustments using a toothpick or the end of a safety pin/paperclip. The newer OysterClasps open and close using a spring loaded lever and are made of cast and milled stainless. The newer Oyster clasp also has an Easy Link, a simple fold out .5mm extension link kept under the clasp cover. 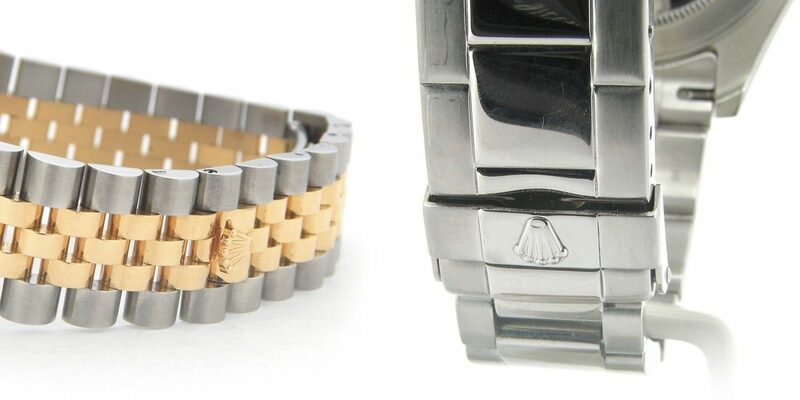 The Oyster clasp is the most prevalent in the Rolex line as it is found on the DateJust men’s and women’s series. OysterLock: The OysterLock is a safety latch found on the Oyster claps that prevents accidental opening. The OysterLock is found primarily on Rolex’s professional series of watches. The latest version contains a mechanism with 15 different components. FlipLock: FlipLock is found on the older tuna can style clasps designed for the Submariner and Sea Dweller. FlipLock is an extension system fitted inside the clasp that allows the watch to be worn over a wet suit without adding Oyster links to the bracelet, a must have for diving watches worn with wetsuits.